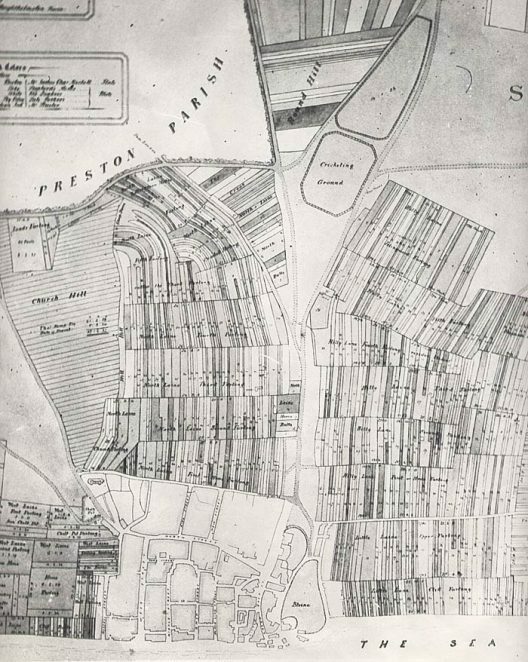 One of the most interesting aspects of the London Brighton & South Coast railway line shown on this map is that the Hove curve, enabling trains from London to travel directly to Hove without having first to enter and then leave Brighton station, had not been constructed by this date! Also of interest is the former obvious importance of the footpath going from the Seven Dials, along what is now Prestonville Road and then Stanford Road and finally Lovers Walk to Preston Road. I don’t think the 1850 map is large enough to show the Cliftonville loop (Railway from Preston Park to Hove). I estimate that it is just to the left of the visible map, working out that the large crescent to the foot of the map is Adelaide Crescent. Where do the railway lines lead to? At the top right of this map, just to the left of where Queens Park Road joins Elm Grove, there’s a short spur-road shown. The end of this is “Scabes Castle”. Does anyone know anything about this? The railway line heading towards the top left of the picture is the London to Brighton railway. The one leading to the right is the Lewes Railway, I am not sure of the one leading to the direct left of the picture. The map is correct for 1850 and correctly does not show the Cliftonville loop (Hove curve) which I believe opened ca.1860. The line to the top left is London/Brighton – top is Lewes – left is the coast line to Shoreham/Worthing and beyond. Holland Road Halt can be seen, the Cliftonville Loop joined just west of Holland Road Halt, however it curved in from the east. Had it been built at the time of the map, it would have just been possible to see it leaving the London line, left hand side of the map, but not the actual position it joined the coast line. The map would show the Cliftonville loop but for two facts. The loop leaves the London line at Preston Village to join the West coast line at Wilburry Villas. It would nearly all be on this map, but the picture of the manor house obscures it. More crucially, the loop was not completed until 1879. The station shown on the West coast line incidentally is the original Hove / Holland Road station which was closed in 1880 and not the Cliftonville / Hove station we know today. Scab’s Castle Farm is shown on the Borough Surveyors map of Oct 1864 relating to the “Report upon the Tanantry Down Roads and Race Ground” I have a copy of the report with all the maps. Unfortunately although Scab’s Castle Farm is shown on the map (where Tanantry Down Road is today) it is mentioned only once and very briefly in the report by the surveyor Richard Edwards dated October 6th 1864. I’m going to scan the map and the applicable section of the report, soon. I have a map of Brightelmston dated 1799 by Edward Cobby. I showed it to an antique dealer who told me it was a pen and ink map and I should get it checked to see if it is of the right date. Can you tell me where I might go with it to find out. It would be really helpful if the 1850 map was much larger. May be the Brighton History Centre won’t allow it. If they will could a larger image be put on line? Hi Paul. if your map by Edward Cobby is rendered in pen and ink, it is either very rare original or a more recent hand reproduced copy. The map was used in his directory of 1799/1800 and has been reprinted in numerous other works. I suspect that what you have is a print of the map. That said, if it is the genuine Cobby original for the map, I suggest you contact Brighton Museum or ESRO. Is there any record of the work put in by William Hallett on the building of the railway? A 19th Century street called Model Dwelling Street in the Pavilion Ward has since disappeared. 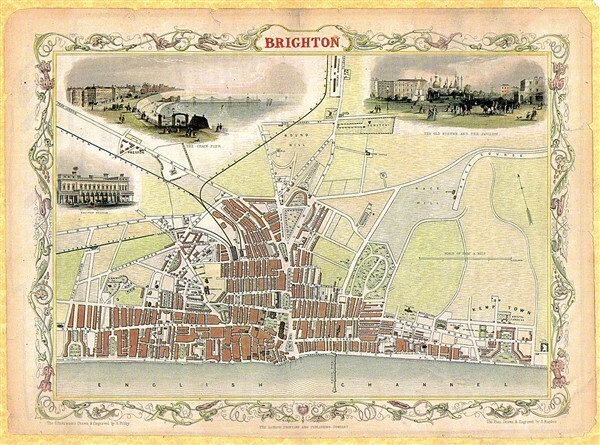 Has anyone come across this street in 19th Century Brighton maps? Can anyone tell me whereabouts in Brighton Nottingham Street was, as I can’t see it on any old maps? Nottingham Street became Spa street, then later Tillstone street, which runs parallel with Leicester street which is part of the Queen’s Park conservation area. Thank you for this site and information. I am doing my family history which takes me to Brighton, Worthing and Shoreham. Would it be possible to have larger maps so that we can actually view some of the places mentioned, or even street maps of these towns (1800’s)? I took my 1799 map of Brighton to the map room in London, they told me it was the a pen and ink map of Brightthelmston and the right age but could tell me no more . Where is the best place to take it to? I took my map to be looked at and was told it is the right date but they did not know if it was done by Edward Cobby but it as a pen and ink map. It has published by ED Cobby, Brighthelmston, 1799 on the bottom . Would he have written this if it was by him? A message for Alan Keay re Model Dwelling Street in the Pavilion Ward. There were two Model Dwellings in Brighton which were blocks of flats built for housing the poor, rather like early council houses but with private funding. Brighton had less Model Dwellings than many other towns and only one block remains – in Jew Street on the corner of Church Street. This may possible be the source of the street name. I have found a map of Brighton and I am trying to date it. It is on fine linen. On the map it has Hove Drove instead of Hove Street, and West Brighton station instead of Hove Station. Can anyone explain this? The original station opened on the site of the current Hove Station was called Cliftonville and West Brighton, it opened on 1st October 1865. The name was changed to Hove and West Brighton in 1893. Finally in 1895 the name Hove Station was adopted. This would date the map at somewhere between 1865 and 1895! To add to the confusion, there was an earlier Hove Station, on the site of Wicks, adjacent to Holland/Davigdore Road. This opened with the line in 1840 and closed in 1880. Close by, 50mts to the west, Holland Road Halt was opened in 1905. The relative position of West Brighton Station on the map may help? If it is on the site of the current Hove Station then between 1865 – 1895 is correct. When the new meat market was built, we were looking for a buried water main and we had a douser suggest a location that we excavated. After repeated confirmations by the douser we got down some 12 feet before we were warned by a visiting Water Board inspector that if we go any deeper we will lose the tractor into an underground water tunnel. The interesting observation was that we had excavated through chalk fill from the new railway and this was sitting on one inch of soft bitumen from an earlier gas works. The water board inspector said that they had wondered how the bitumen was getting into the water supply. Does anyone know of the whereabouts of a Chalk Farm in Brighton in the mid 1800s? I don’t know if this helps but in the 70’s I used to ride a trails bike on chalk pits just past the A23 pylons western side. It is the northbound carriageway now! Does anyone remember Jean Bennet who lived in Elder Street off New England? Durf! I can’t read the street names! I am writing a book that takes place in 19th Century Brighton and I need street names. Do you have some maps with street names on it? I would love to know. Thank you. Hello, I am writing a documentary film on a pair of very famous Siamese twins from Brighton. They were born three in 1908 and I am trying to track downs some of the places they lived and frequented. I am looking for the following addresses in Brighton in 1908. Is there a way to find out if these roads still exist, or if and when they were renamed and or if your library might have a historic map with these roads/addresses on them? I would love to hear your thoughts, thanks Morgan for Brighton from 1908: 15 Riley Street. (The Hilton sisters were born) this is supposed to be in the Bear Hill section of city – where is that? What is the closest cemetery to this place (Bear Hill in 1908)? The cemetery back then was a hillside cemetery 56 SURREY STREET (MARY’S NEXT BAR) 5 Brighton Place (salon where possible father of Hilton sisters worked) do they know where a bar named The Queen’s Arm in the Bear Hill section of the city would have been in 1908? Brighton Hippodrome cemetery where KATE SKINNER is buried she DIED AUGUST 1912, BORN AUGUST 1886 IF THAT HELPS IN YOUR SEARCH. Hi Morgan, I wish you luck with your documentary. I should be able to assist with almost all of the questions you have raised, but in order to save on continuous messages (that need to be vetted and approved) going via the website, it would be best if you contacted me directly on my email address, genie_alogist@yahoo.co.uk Regards, Andy. Hi, I’d love copies of both these maps. Is it possible to get prints done? Does anyone know who to contact? Many thanks (and great website). Editor’s note: Contact the Brighton History Centre which is in Brighton Museum. Hello, I am trying to find out the whereabouts of Crescent Cottages, St Georges Road was exactly. Any help gratefully received, thank you. Hi Wendy. By doing a bit of detective work, I think I’ve found where Crescent Cottages used to be. At 8 St Georges Road there is a pub called The Thomas Kemp (it used to be the Burlington Arms/Hotel). Next door to the pub going east is a relatively modern block (well, compared to the age of the rest of the street) called Garnet House. There’s a post office and other shops on the ground floor. Garnet House extends to the corner of, and around into, College Road. I believe Garnet House was built on the site of Crescent Cottages. Hope this helps. Hi Wendy, Crescent Cottages cottages connected Upper Bedford Street to Montague Place and backed onto Montague Street. The road was built during the 1820’s but the area has since been redeveloped. Regards, Andy. Looking at the posts above, it seems that I was wrong about the location of Crescent Cottages. Sorry! I was going by what I thought was the route of the enumerator on the 1891 census. So much for my detective work! However, in the photograph in the James Gray link above, aren’t the council houses too modern? Crescent Cottages existed in the 19th century. Crescent Cottages were part of the early post-WWI demolition of slums. They appear in the Brighton Medical Officer of Health reports in 1924 as being in line for demolition; the Kelly’s Directory 1927 shows houses numbered from #17-35 on the north side, indicating demolition was underway, and only #44-45 on the south side. A big thank you to all who have posted, it has really helped and the information and links are greatly appreciated! Thank you. Hi Andy. Is it possible you are looking for Chate Farm, not Chalk Farm? If so contact me at primaldivine@gmail.com. Thanks, Jamie. I am looking for Bosses Gardens as it would have been in 1937. I believe it was behind St James’s Street Post Office. I was born in Edinburgh Rd of Lewes Rd Brighton in 1944. I lived there until I was 21. Has any body have photos of that part of Lewes Rd? I would love to see them, many thanks. John. I am trying to trace my 4x grandfather who lived in Cavendish Street in 1841. Please can you tell me if this street did exist in 1851? I cannot find him, his family or the street! Any help would be gratefully received. Thank you. To George Higgs: if you find high street a street between Edward Street and St James street, Cavendish Street was the next one down towards Castle Square, so just behind High Street, it used to run up to Edward Street from St James as a through road. It is now closed off and has been renamed if you find White Street it is the just across the road southwards with the building that was the Little Globe Pub on the corner. This is now offices but on the Edward Street facing wall up high I believe you can still see the old pub name. Cavendish street has been renamed Dorset Place. all the old house etc have been pulled down. We had a similar problem trying to trace someone in Brighton around that period. I was told that some pages from the early censuses are missing but I can’t remember now exactly which area that covered. Two things: 1. The line that branched north from the Shoreham line around Holland Road Halt, ran northwards up to the Devils Dyke. 2. Does any one recall the Arnett family who lived in a bungalow near the Withdean Stadium in the ’50s? Hi John, sorry but you are wrong regarding the branch line from Holland Road Halt……., it was not really a branch line, its the Cliftonville Curve, connecting the Southcoast line to the main Brighton to London line. The branch line that ran to Devils Dyke, ran from Aldrington Halt, you can read about it here.